This week we are featuring John Fuller, Brittany Brown, and Brittany Leavitt in the Firefly classroom. Their two year old class was all about transportation so they decided to make it their next unit. I joined John for his introduction to trains. Below you will find a reflection from John, Brittany, and Brittany and images from John’s lesson. This week the Firefly classroom started a unit on transportation. 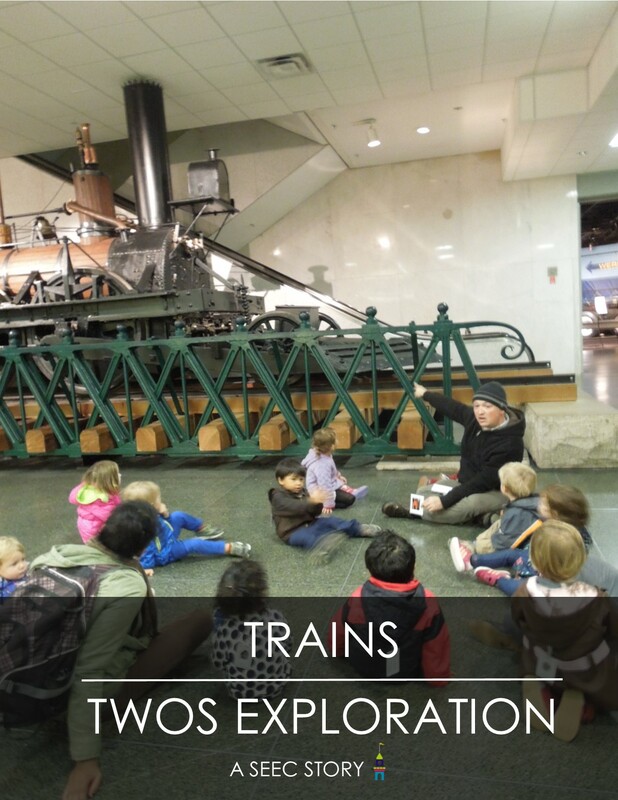 We began by exploring a favorite subject of most two year olds; trains! 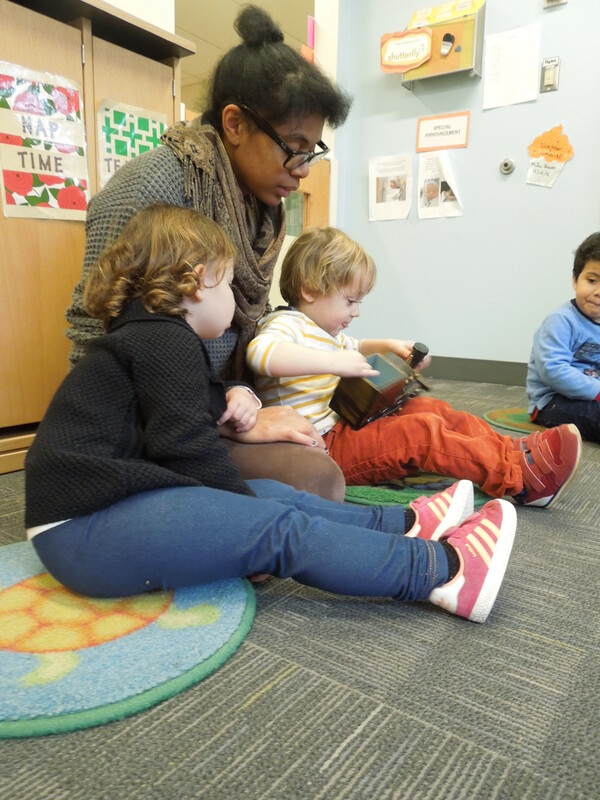 We had noticed a definite interest in playing with trains from a number of our children in the classroom, and decided that this would be a good way to introduce the theme of transportation in general. We also were aware of feedback on some of our surveys that were handed out at the beginning of the year that this was a favorite thing to do at home. We were aware of the John Bull engine from previous visits to the American History museum, and saw how excited our children became when we passed by it. Children at this age seem to have a love for trains in general, but we also noticed a special fascination with the steam engine, and decided to focus on that theme for a while. Since they usually don’t get to see steam engines in their day to day lives, we thought seeing one that was already somewhat familiar would be a good way to kick things off. The day before, and that morning, we had presented a set of picture cards to the children, first with the names of different cars and engines on a train (including the steam engine), and then with the names of different parts of a steam engine (chimney, cowcatcher, wheels, etc…). We had also identified the parts on a model steam engine that the children passed around. Repetition of information in different contexts is a powerful learning tool, so looking at these same parts on a real steam engine was a way to reinforce the vocabulary words the children were learning in a fun new way! We wanted the children to have fun and continue to learn the parts of the engine, and both of these goals were achieved. It also let the children see that although steam engines may look different (size, shapes and colors), they share the same parts. This helped when we took another trip to American History later in the week. By the time we got to look at paintings of trains the next week at the Museum of American Art, the kids were finding the parts and telling us about them independently! In terms of logistics, because it was earlier in the week, we tried to make the trip short and sweet. We find that our class is ready for longer, more involved lessons later in the week, and keeping things brief and to the point (at least initially) sets them up for full successful engagement in the experience. We also made sure to bring along the picture cards, so the children could have a central point of reference for the parts/vocabulary words. Looking back, there are a number of things we could have done to make the visit even more successful. We could have made more cards once the kids had learned the first parts, and continued learning about the parts of the train. We could have given these cards to each child individually and asked that child to find the part on the John Bull, to personalize the experience even more. We could have done a vignette where the children acted out the parts of the train and then moved as one through the room (this probably would have required some practice beforehand). Logistically, we didn’t realize until we got there that there was a fence around the engine that made certain parts hard to see. If we had prepared better, we might have thought about a specific way to move around the exhibit, or even taking turns holding children up to see parts that were more hidden. If others were to do this lesson, I would recommend having a few different paths to follow, based on the children’s interest. For example, if they had a lot of questions about the smoke that comes from the chimney, having some kind of follow up visit prepared that could address that specific question, or if the wheels caught their interest, being ready to show a variety of other vehicles with wheels for comparison. John began his lesson by introducing the steam engine to the class. He explained that they would be learning about the different parts of the train and then visiting an actual steam engine at the National Museum of American History. John passed around a model steam engine for the children to handle. They enjoyed making the wheels turn and exploring the smokestack. They were next handed laminated cards with labeled images of different parts of the train. John pointed out the different elements on the model train. 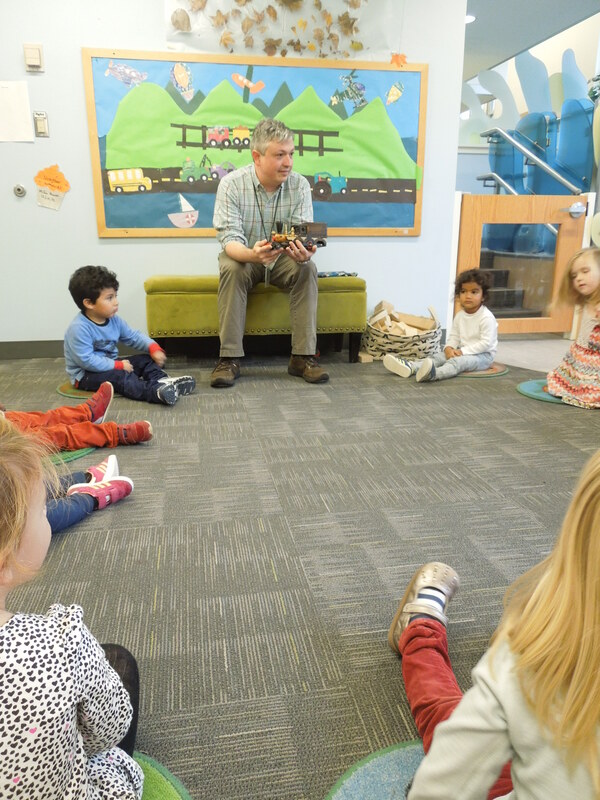 The children were fascinated by the cow catcher and John demonstrated with a plastic cow how the front of the train would gently nudge the cow to get off the tracks. Then it was time to head to the National Museum of American History to see the John Bull Train. John brought along the same laminated cards and worked with the group to match them to the steam engine. John, Brittany, and Brittany finished up their unit on winter and started exploring holiday traditions. Check out our Facebook, Twitter, Instagram, and Pinterest for more ideas from their unit on trains! See you in two weeks with our next Teacher Feature! ← History Isn’t Just for Adults!